Nearly 100 cats were removed from a Mount Clemens home Thursday, according to Macomb County Animal Control. Officials discovered 88 cats living in "deplorable conditions," where police believe the owner was facing eviction. Many of the cats are pregnant. 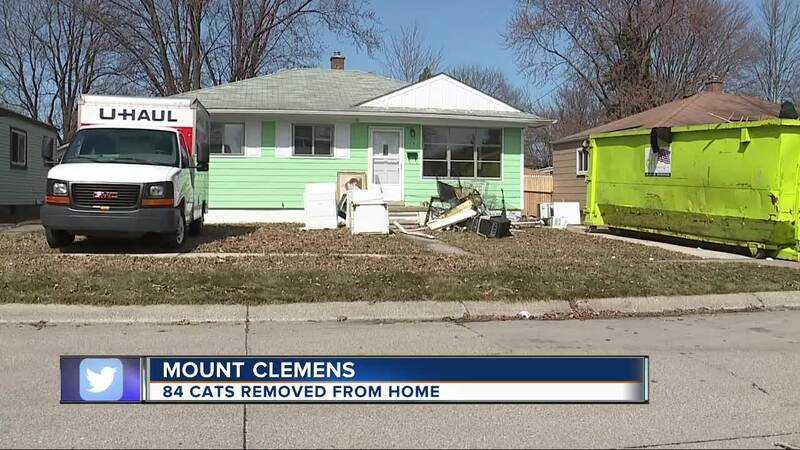 MOUNT CLEMENS, Mich. (WXYZ) — Nearly 100 cats were removed from a Mount Clemens home Thursday, according to Macomb County Animal Control. Officials discovered 88 cats living in "deplorable conditions," where police believe the owner was facing eviction. Many of the cats are pregnant. They also found a dog and a beta fish in the home. According to the chief of Macomb County Animal Control, the woman has been living at the home since November 2017, and it is unclear how long the cats have been in her possession. The animals are currently at the Animal Control shelter, and rescues are working to get the cats food, litter and necessary medication. They say they are in desperate need of the following supplies. The shelter will be open Saturday, March 30 from 10:00 a.m. to 1:00 p.m. for donation drop off. Macomb County prosecutors will be handling the case and charges against the woman are still being determined, police say.